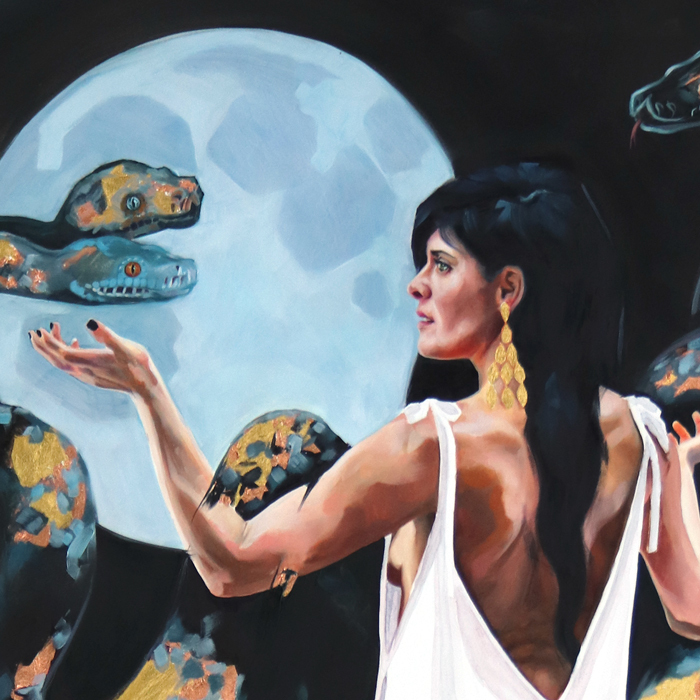 Own the original 24 x 36″ painting of the Serpent Sorceress. She will add some magic to your space as she conjures her glowing metallic snakes before a misty moon. Oil, watercolor, 24k gold, and copper on panel. No reproductions will be made to this size, so she is one of a kind. The majority of the painting is done in oils, with the exception of her clothing, which is done with watercolor to give it the haunting effect. The snake’s skin is a mixture of both 24k gold and copper leafing. It reflects beautifully in the light. The painting is framed in a recycled barn-wood frame made in California. While I had no idea how women’s voices and worth would be questioned so publicly recently, it has only enlivened my passion and deepened the meaning of these paintings for me. From the beginning they have been meant as a totem of empowerment, and now I see their delicate golden strands entangling themselves within current events. These etherial paintings of women-animal goddesses serve as a reminder of the magic and power inside each of us. They are a celebration of the Goddess in all women. Of the deep connection to nature we feel and the divinity always present at the root of our souls and bodies. These modern-day goddesses are meant to lift up each and every woman — to remind us of who we are, where we come from, and what we are capable of: Magic. Together we are stronger, and you are never alone — I am here holding your hand and standing with you. Thank you to every woman who has been brave enough to tell her story. And to every man who has believed her and stood with her, unquestioning.